Forest Landing at Bethany Bech is an active lifestyle community of 280 attached and single-family homes built by Ryan Homes. Set in Southern Delaware, the community is surrounded by tranquil, natural beauty. The community is a short distance from the the ocean, offering endless opportunities for outdoor recreation. Closer to the community, residents will have access to a community clubhouse, pool, tennis courts, and miles of walking trails. Residents will enjoy a relaxed, low-maintenance lifestlye in Frankfort, DE while living in Forest Landing at Bethany Beach. 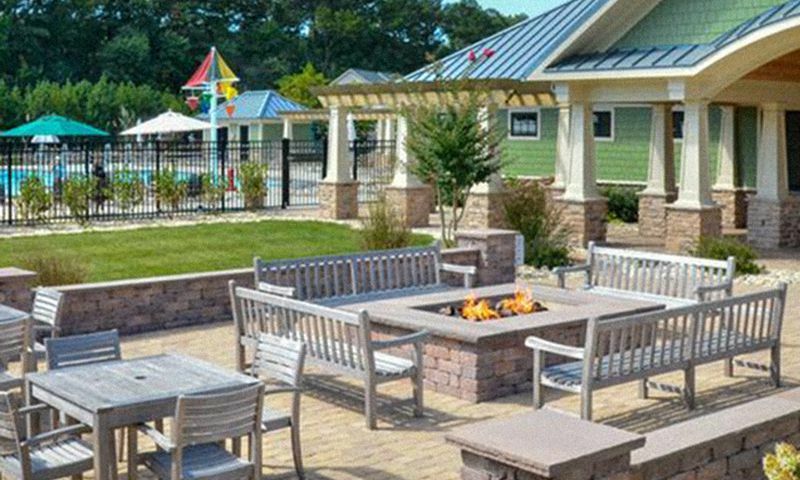 Active adults living at Forest Landing at Bethany Beach will have access to a variety of great amenities. A clubhouse nestled in the heart of the community will house many of the wonderful features of this neighborhood. A fitness center provides a residents a place for exercise. Residents will be able to hold community meetings and gatherings in the multi-purpose room. Snacks for parties can be prepared in the catering kitchen. Outdoors, a pool and patio provides opportunities for active exercise or just relaxing with a good book on warm days. There is also a tot lot. The builder is taking care to preserve one of the greatest assets of Forest Landing at Bethany Beach's location: the abundant natural space. Green spaces and parks, linked by miles walking trails imbue a sense of calm and tranquility. Respected builder Ryan Homes built the 280 attached and newly planned single-family homes. Carriage homes will start at 2,238 square-feet with three bedrooms, two-and-a-half bathrooms, and attached two-car garages. Villa homes will be 2,038 square-feet, 3 bedrooms, two-and-a-half bathrooms, and single-car garages. Floor plans for single-family homes have not yet been disclosed, but are sure have the design features homebuyers expect from Ryan Homes. Carriage and Villa attached homes feature first-floor master suites ansd his and hers vanities and have other customizable options. Foodies will love the spacious kitchens with wide granite countertops and stainless steel appliances. Flex spaces allow homebuyers to personalize their home to their interests and tastes. Residents at Forest Landing will have plenty to look forward to. Social gatherings are commonplace at the community clubhouse. Active adults will be able to enjoy a brisk swim or challenging game of tennis among friends and neighbors. Taking advantage of the area's natural beauty will be easy with the miles of walking and biking trails connecting parks and green spaces throughout the area. Homebuyers can leave their lawn mowers and behind. A homeowners' association will take care of all lawn care as well as common area maintenance. Residents of Forest Landing at Bethany Beach will find it easy to make the most of their prime location because daily needs are just a short drive away. Just three miles north on Central Avenue are two grocery stores, banks, restaurants, and a post office. Heading east along Garfield Parkway, one will find more restaurants and retail stores and, just three miles farther, the quaint oceanside community of Bethany Beach. This historic resort town features a boardwalk, sandy beach, and restaurants, all while embracing its own quiet style. Southern Delaware has plenty of attractions to keep residents active. In the immediate area, homeowners will have access to Bethany Beach, Fenwick Island State Park, Assawoman Wildlife Area, and Holt's Landing State Park. The highly regarded Dogfish Head brewery is just under 30 miles away in Milton. Nearby Millsboro offers golf courses, a marina, and restaurants. Forest Landing offers the desirable area and amenities to make it a great active lifestyle community in Frankford, DE. There are plenty of activities available in Forest Landing at Bethany Beach. Here is a sample of some of the clubs, activities and classes offered here. Respected builder Ryan Homes built the 280 attached and newly-planned single-family homes. Villa homes will be 2,038 square-feet, three bedrooms, two-and-a-half bathrooms, and single car garages. Respected builder Ryan Homes built the 280 attached and newly-planned single-family homes. Carriage homes will start at 2,238 square-feet with three bedrooms, two-and-a-half bathrooms, and attached two-car garages. Floorplans for single-family homes have not yet been disclosed but are sure have the design features a homebuyers expect from Ryan Homes. 55places.com is not affiliated with the developer(s) or homeowners association of Forest Landing at Bethany Beach. The information you submit is distributed to a 55places.com Partner Agent, who is a licensed real estate agent. The information regarding Forest Landing at Bethany Beach has not been verified or approved by the developer or homeowners association. Please verify all information prior to purchasing. 55places.com is not responsible for any errors regarding the information displayed on this website.